NO CLEANING FEE FOR RESERVATIONS BOOKED BY MARCH 31st! 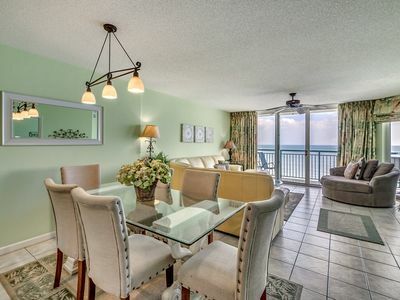 Beautifully decorated privately owned beachfront condo! Make memories sitting on one of two balconies watching the sun rise, the moon shining on the ocean and listening to the sound of the ocean. 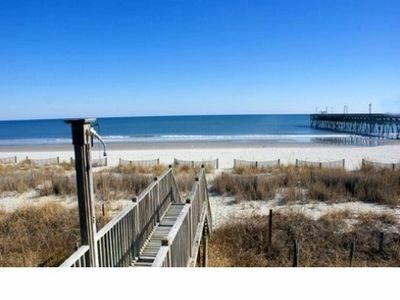 Perfect location for SOS, Beach Music Festival, Endless Summer, CBMA Awards, free weekly concerts on Main, (6/13-10/31),etc! Park your car and walk 2 blocks South! Easy accessible ELEVATOR! Carts for loading luggage, groceries, coolers, etc. No keys to worry about! Keypad deadbolt lock! NO KEYS TO LOSE OR RETURN! Newly remodeled and decorated in April 2016! New furniture in living area 2017! New stainless steel kitchen appliances added in 2018! Fully equipped kitchen with drip coffee maker and Keurig! 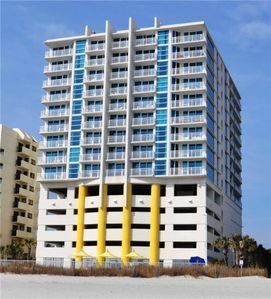 Beachfront condo only a few steps and you are on the beach. 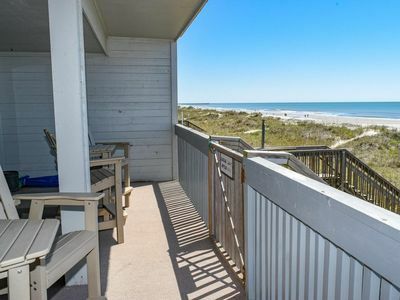 The only thing between you and the beach are the dunes with an unobstructed direct view of the ocean and beach from both balconies. It is suitable for ALL ages with an elevator for easy access. 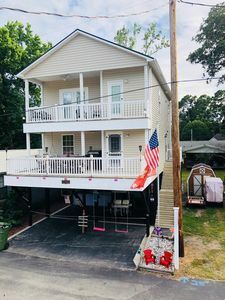 The condo is on the second floor near the end with very little traffic in a three floor building in N Myrtle Beach with an unbeatable view and fantastic location with entertainment, restaurants, small shops, and a theme park within walking distance and 2 blocks from Main Street. NMB Parks & Rec offers free outdoor concerts every Thursday night 7-9 May-Sept. Cherry Grove Pier is located a couple of miles north. 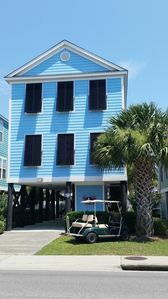 There are over 100 golf courses within the Myrtle Beach Area. 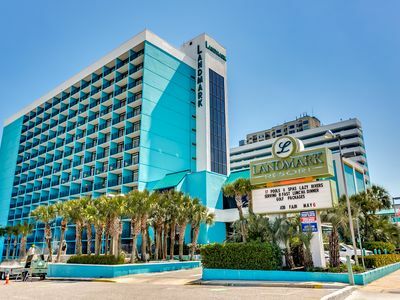 It is 10-20 minutes from Myrtle Beach, Barefoot Landing, Broadway at the Beach, Tanger Outlets, Alabama Theater, and Myrtle Waves. It very quiet and relaxing. 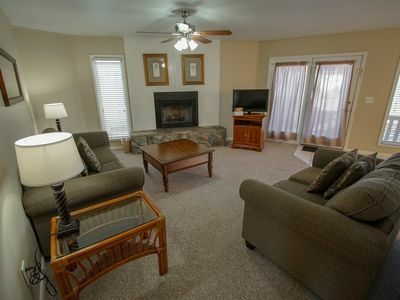 There are 3 bedrooms and 2 ½ baths. Internet and free WiFi are available. The master contains a king bed, private balcony. 32" LED Smart TV with DVD player & internet connections using a FireStick allowing access to Netflix, Hulu, YouTube, etc. and can be used if you already have these accounts or connect your game systems. The private bath has a tiled shower and private access to one of the two balconies with a fabulous view. 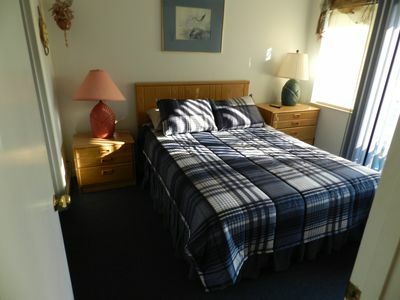 Bedroom #2 has a queen bed with a 32" LED Smart TV with DVD player and shares the hall bathroom w/tiled bath and shower. 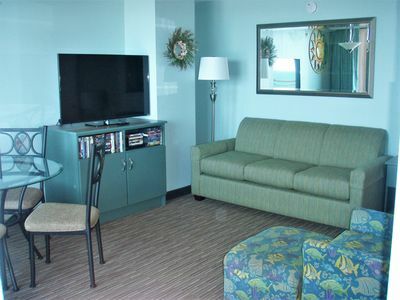 Bedroom #3 has a set of twin beds, ½ bath, 32" LED Smart TV with DVD player. All TVs have Internet access. 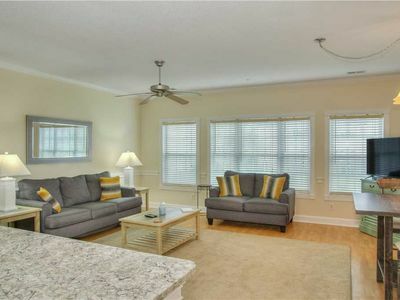 The kitchen has granite counter tops, dishwasher, refrigerator w/ ice maker, above oven microwave, smooth top stove, coffee maker, toaster, blender, cookware, silverware, & dinnerware. 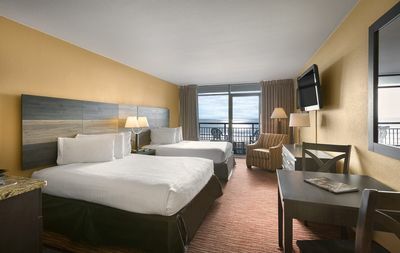 The den has a 40" LED HDMI Smart TV, DVD player and access to the screened balcony with a beautiful view of the ocean from the kitchen and den as well. Tile flooring covers the entry hallway, kitchen, wet bar, bathrooms and den area. The bedrooms have hardwood flooring. FREE WIFI is available for connecting your personal devices as well as TVs. Movies for the children are in the condo for your use. 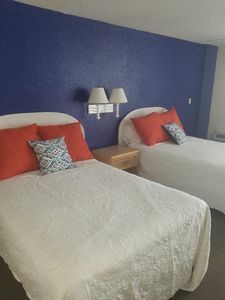 There are 2 swimming pools, a hot tub, tennis courts, an outdoor grilling area, beach toys for the children, and beach chairs are available for your use. Sit on the balconies, relax, enjoy the view and the sound of the waves or enjoy the wide variety of entertainment available. Owner welcomes your emails, calls or text messages for any questions. The map is showing the location in building #4 which is behind where the condo is actually located. Building #1 is the one in front with direct ocean view. 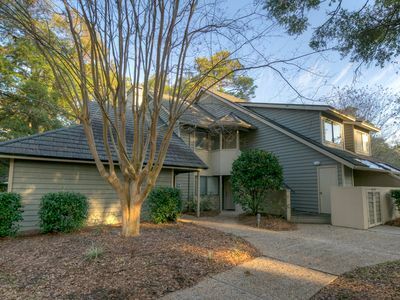 See last picture for complex map and condo location. HOA does NOT allow pets on the property except property owners and service dogs. **Linens are not included. The rental agency offers a linen package for $110 or you’re more than welcome to take your on. Renters are responsible for paper products that they will need during their stay. SHADING DEVICES ON THE BEACH: Placement of shading devices on the beach from May 15 through September 15: Other than umbrellas with a center pole no greater than 7 feet, 6 inches in height and with a circular shade no greater than 9 feet in diameter, and shading devices no larger than 36 inches high by 36 inches wide and 36 inches deep used to provide shade to persons 18 months of age or younger, all shading devices, including but not limited to tents, tarps, cabanas, pavilions, sports-brellas or devices similar to sports-brellas, or any material mounted on supports are prohibited from being placed on the beach from May 15 through September 15. An umbrella is defined as a collapsible circular shade consisting of a natural or synthetic fabric stretched over hinged ribs radiating from a center pole without grounding lines or ropes. If you dig a hole on the beach, you must fill it in before leaving the beach. Discounts! 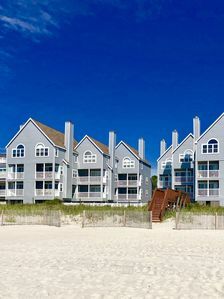 Direct Oceanfront w/Pool Great Location "Breakers Edge" 5 STAR RATED! Wk of 8/17 open. 3 wks in Sept. Nov-Dec. Book Now!!! 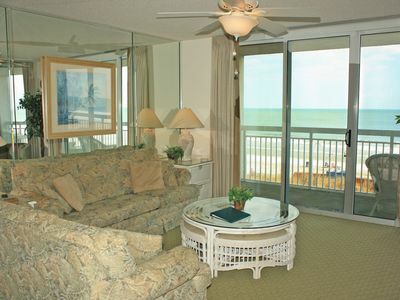 Crescent Shores Spectacular 2BEDRM Ocean Front View Overlooking Lazy River! 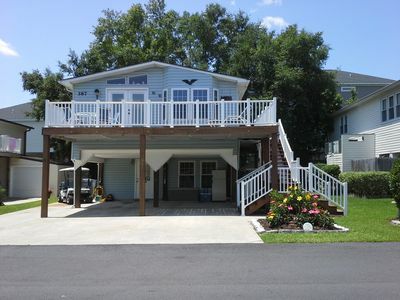 Beautiful 3BR Villa with the BEST Kingston Plantation Rates! 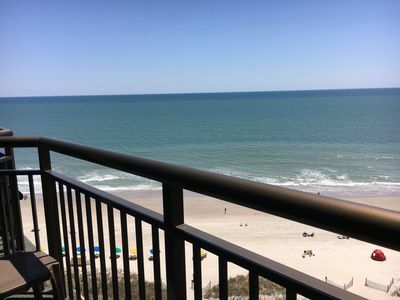 Spacious & Clean Two Bedroom Condo in Surfside Beach! 1 Bedroom over looking the pool! 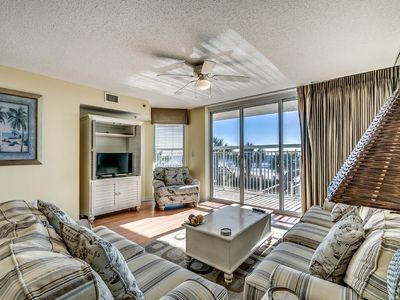 Windy Hill Dunes 1203, 3 Bedroom Beachfront Condo, Hot Tub and Free Wi-Fi! Easy Rental, Multiple pools, Lazy River, check for discount rates, Email! 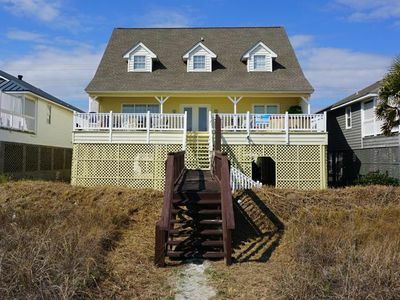 Ocean lakes family friendly rental 6 bedrooms! 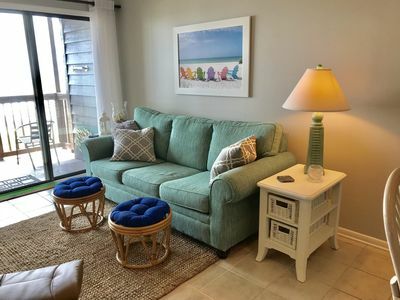 Crescent Shores 107, 3 Bedroom Beachfront Condo, Hot Tub and Free Wi-Fi!